Individual, companion and family lots are available throughout Woodbine Cemetery, and can be purchased as needed, or more ideally, as part of our Pre-Need Program. There are lovely settings for ground burial. Choose from upright monuments to simple lawn-level markers. Woodbine Cemetery also provides a perfect background for visitors to relax and remember loved ones in peace and tranquility. 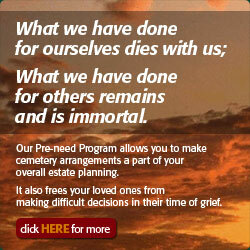 There are several aspects to consider when planning your in-ground burial.